New Designs- Sundrop Crystal Gifts $30.00 $25.99 On Sale! Dainty Dangle- SunDisc 40mm With A Rainbow of Beads NEW! Enjoy a Rainbow of Beads! Dainty Dangles! Beautiful Swarovski Crystals with Rainbow Crystal Bead Hangers! Crystal Creations are about 4 Inches in Length plus 5 to 6 inches of wire for hanging, 9 to 10 inches total. They are delicate and dainty, not huge or heavy. Perfect for a car decoration, a small windowpane, or anywhere you wish to put them! USA Hand Made here at Sundrop Crystal, with Fine Workmanship designed to last! Wonderful Thoughtful Sparkly Beaded Crystal Gift! The SunDisc 40mm (1.5 Inch) Clear Crystal is a Very Lovely Creation. Quite Flat, Perfectly Circular, Lovely Feathery Facets, and a Clear Center (not a hole!) to allow Feng Shui Energy to Flow Right Through! Rainbows are Numerous and Scattered in a Circle! Just Wonderful!! Lovely Rainbow Crystal Beads Just Add to the Fun! $26.00 $19.99 On Sale! Sun Disc 40mm~ Topaz Sorry~ SOLD OUT. Beautiful Delicate SunDisc in absolutely delicious deep Topaz golden color. A great new thing from Swarovski and you Must See It!! Completely Spectacular with AB! Genuine Swarovski Crystal $20.00 $17.99 On Sale! 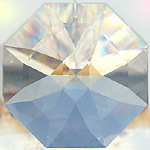 Sun Disc 40mm Clear -OR- 40mm AB This Fabulous crystal is nearly flat and perfectly circular, no angles anywhere! Size is about 1.5 inches. Pointed Sun-Ray facets are all around the edges, waiting to play with the Sun! The center of the crystal is perfectly clear with no facets, allowing light and energy to pass straight through. Perfect for Feng Shui! Have some fun, look at your jewelry through this crystal. You'll see interesting patterns! Available in Clear, Topaz, and with Shining AB! Great Rainbows! A Very Beautiful Crystal! Genuine Swarovski Crystal $20.00 $16.99 On Sale! Matrix ~ 50mm or 32mm Matrix Crystal! A perfect smooth oval with loads of rectangular facets~ Very much like a flattened faceted egg. Two Sizes! 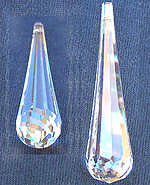 The 50mm crystal is a plump and generous two inches in length. Lots of crystal, ready to make lots of Rainbows! Bright and Sparkly! Clear Or AB Crystal! New Design From Swarovski! There is a smaller 32mm size. This wonderful little fellow makes a big shining impact. A perfect oval, 1.25 inches, with loads of shimmery rectangular facets. This crystal is plump and sparkly! Bright and gleaming! Enjoy Yours Today! Genuine Swarovski Crystal $25.00 $19.99 On Sale! 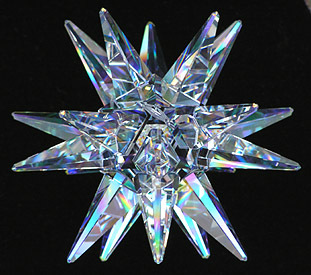 Dahlia 50mm OR 38mm Magnificent New Creation from Swarovski! Many, Many, Many Facets! Sparkling and gorgeous. Facets resemble the petals of a Dahlia Flower. Treat yourself! You're worth it! Or choose it as a really amazing gift! Genuine Swarovski Strass $38.00 $34.99 On Sale! SunDancer 28mm -OR- 28ab Here's the beautiful baby of the SunDancer family! Just as wonderful in this small size as in the larger ones! It's a great way to get acquainted! Try one, it's a treat! This design is the always fabulous Sundrop Octagon, with Extra Facets added! NEW!! Golden AB! This little treat is now available in sparkling Golden AB! Gorgeous! Genuine Swarovski Crystal $16.00 $13.99 On Sale! SunDancer ~ 60mm, 50mm, or 40mm Sun Dancer Octagon Prism! 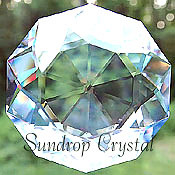 This is a NEW octagonal crystal like our favorite Sundrop! Freshly designed, with exciting facets added. This crystal is very sparkly and very beautiful. It is also impossible to photograph, so our pictures cannot do it justice! Great Rainbows! Lovely flowery facet pattern. This design is based on the always fabulous Sundrop Octagon, with Extra Facets added! Gorgeous! A new creation from Swarovski, and they have outdone themselves. This is a WONDERFUL crystal! Enjoy yours today! Four fabulous shimmery sizes! Try the GRAND 60mm Size! Add a Rainbow of Crystal Beads on the hanger for even more Fun! A perfect addition to your collection! Genuine Swarovski Crystal $60.00 $49.99 On Sale! Flame ~ 50mm -OR- 35mm New from the Designers at Swarovski! They have outdone themselves, this is GORGEOUS!! Filled with Fiery Rainbows! Very bright, a wonderful new addition to the world of crystals! Triangular in shape, but rounded at the bottom, like a piece of bread folded around something delicious to make a sandwich. Hefty and chunky, and hangs from a dainty point at the top. Smooth large facets sparkle in any light and make rainbow colors. And when this crystal gets near sunlight, the name is well earned! Fiery tongues of Rainbow flames fly all over! Two great sizes! The Large 50mm size, 2 inches, is big, heavy thick, lots of incredible, beautiful crystal! Treat yourself to one of these!. It's a Beauty! The smaller 35mm size, about 1 3/8 inches long, is also a nice chunky sparkly crystal! Goes crazy in sunlight, you must have one of these! Available in Clear or with Sparkly AB Gold Coating! Add a Rainbow of Crystal Beads! ~Sorry, Flame 50mm Clear is Out of Stock. Genuine Swarovski Crystal $35.00 $29.99 On Sale! Spiral Icicle ~ 100mm or 76mm Spiral Icicle! This crystal is a delightful surprise. Sharply tapered, faceted at an entirely engaging odd angle, and hanging from the end that looks like it should be the bottom! Gorgeous! The Spiral Icicle 100mm Size is artfully shaped, exquisitely detailed, and a full four inches in length! The smaller delicate 76mm size is a full three inches in length. A brand new shape for the ever beautiful icicle! It shimmers from every angle. Experience this! Genuine Swarovski Crystal $30.00 $26.99 On Sale! Crystal Wand - 63mm Crystal Wand! A new design from Swarovski and packed with incredible sparkle! Long narrow facets on the sides make big reflections. The bottom end is rounded and just covered with small facets that love to play with light! Wonderful! Swarovski $30.00 $24.99 On Sale! Twist 50mm ~ One Hole -OR- Two Holes Great New Item! Elongated, LOADS of Facets, in a Twisted pattern. Sparkly and Wonderful! One of the Newer Items From Swarovski! NEW!! TWO HOLES! Beautiful Twist is available with the usual one hole for hanging, or with TWO holes for adding something to make your own creation! Holes are at top and bottom. Get creative! Genuine Swarovski Crystal $20.00 $17.99 On Sale! SeaShell 28AB You'll smile when you see this great Seashell! It looks amazingly like a real scallop shell from the ocean shore! Lovely radiating lines, thick crystal for rainbows, and a beautiful rounded scalloped edge! Two sizes, to match up with the wonderful Star Fish! The 28mm size is 1 1/8 inch. Something New and Different! With AB, only! Beautiful! Swarovski $16.00 $14.99 On Sale! 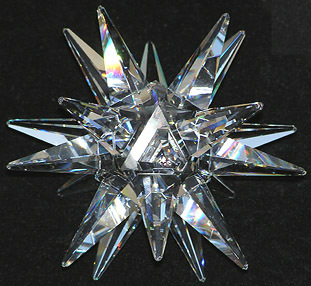 StarFish 28mm OR 28AB An utterly delightful rendition in Crystal of a Star Fish from the Ocean! Wavy arms and an irregular shape make it look almost alive! New Design in 2004 from Swarovski! Now with AB, too! Swarovski $15.00 $12.99 On Sale! Heart Prism ~ Wild Heart WONDERFUL NEW ITEM! Clear, Crystal AB, or New Red Magma! Incredible Sparkly New Wild Heart from Swarovski! This will make you say WOW! The shape is a little bit different than the classic crystal heart shape. And the facets, well, they are just Wild! Lots of irregular facet shapes make blazing sparkles in all directions! This fantastic heart is available in Clear Crystal, AB Crystal, and a New gorgeous Bold Red color called Red Magma. New Shape, New Color!! Beautiful Sparkles! The same sweet message! Are you Wild about someone? Tell them with a fabulous Wild Heart Crystal! Two sizes, a lovely generous 37mm size (Clear and AB only), or a delicate smaller 27mm size (Red Magma only). Add even more gorgeous sparkle with Crystal AB beads on the hanger! A very BEAUTIFUL item and a perfect gift! Swarovski $29.00 $25.99 On Sale! Fairy Wing 50mm Or 50AB A lovely many-faceted and delicately shaped crystal. Very different from all the others! A narrow, curved shape that would make a great fairy or angel wing! Two inches in length. Something small and pretty to add to your collection! Swarovski $20.00 $16.99 On Sale! This lovely crystal decoration will sit on a clock, mantel, table, or windowsill ~ Any surface that begs for something gorgeous! Colors constantly change with the light and viewing angles. 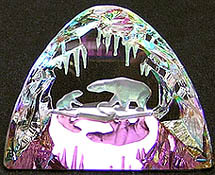 Exquisitely detailed figures of a mother Polar Bear and her Cub in an Ice Cave are seen both in the face of the crystal and reflected in the base. The frosty carved icicles glow with lovely rainbow colors. This is truly a precious item. Sized to fit anywhere at 2.25 inches tall and 2.5 inches wide. You will never tire of this lovely creation! Magical Iridis crystal color scheme shimmers with a full range of bright rainbows of color. Fantastic Desk, Windowsill or Shelf Decoration! $32.00 $23.99 On Sale! Wing 80mm The Wing is a deceptively simple looking shape. This crystal is hefty and over 3 inches in length, with plain lengthwise long facets. It is not flat, but slightly curved, with one surface a bit more rounded than the other, just like a wing! Here's the best part. When it gets into bright light, it makes criss-crossing and radiating rays of light! Rainbows, too, of course, even with candles! New for Fall 2002 from Swarovski! Genuine Swarovski Crystal $40.00 $35.99 On Sale! Crystals make gay colorful rainbows that flash all around them. Crystals are shiny & shimmery and very beautiful. You must enjoy these crystals for yourself to understand the pleasure and entertainment they provide! Crystals can create high drama in sunlight! Sunlight is refracted, causing the bright colors of the rainbow to become visible! Brilliant flashes of light, as seen in this photo, and beautiful colored Rainbows, are produced by the crystals! They Light up Your Home and Your Life!